The ASUS ROG Spatha mouse is an eye-catching gaming mouse with 12 programmable buttons, flashy LEDs, wired, wireless mode, OMRON switches, and comes with its own charging stand. Knowing exactly where your opponent is can make all the difference between winning and losing. That’s why gaming headsets are such a crucial piece of the gaming gear puzzle and the Strix Headset does this with a full hardware implementation of discrete drivers for a full surround 360 headset. At the heart of each ear cup, there’s an impressive 5 neodymium-magnet drivers for accurate audio positioning. 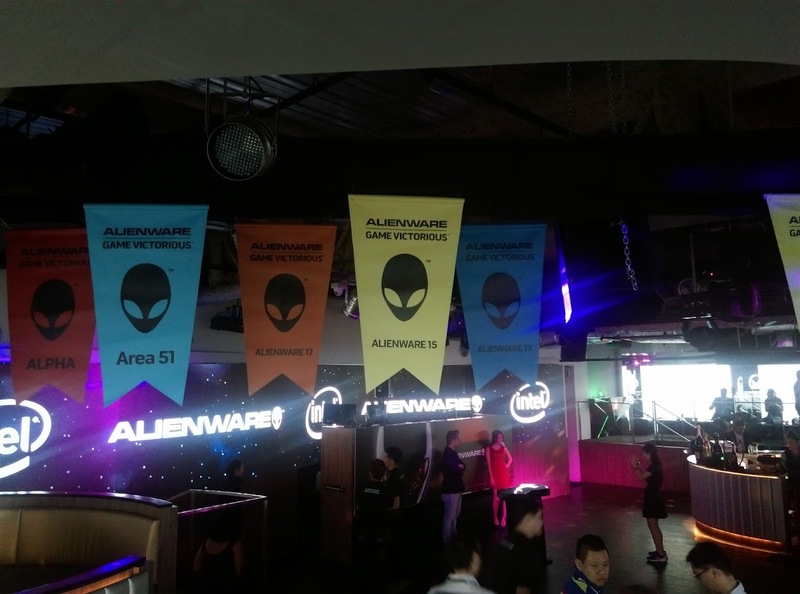 Alienware held a launch event at Alimate, 1-Altitude, a VIP club perched on the 61st floor of One Raffles Place, ofering glorious views of the skyline. But the main stars of the show were the swanky new gaming systems from Alienware. Alienware fans have a bevy of new devices to choose from in 2015, ranging from the Alienware 13, 15 and 17 gaming laptops, and also the Alienware Alpha Console. There’s also the innovative Alienware Graphics Amplifier and the Area-51 desktop for the discerning gamers. The available devices are now online at the Dell Store for customisation. There’s an ongoing lunar new year promotion too for selected Dell / Alienware products. The new Alienware laptops are designed to be thinner without compromising on performance. The recently launched Alienware 13 is by far Alienware’s thinnest laptop ever, and the new Alienware 15 and 17 are both more than 20 percent thinner than their predecessors. Built with elements such as copper, aluminum and aerospace-inspired carbon fiber-filled materials for a rigid and performance-focused mechanical design, the Alienware 13, 15 and 17 focus on components that matter to gamers. The laptops also have a premium full-size keyboard with reinforced metals for uniform typing feedback, ensuring comfortable travel and quick responsiveness for gamers in action. They do not have mechanical switches though, for that you would have to go for the MSI, but that’s really a unique laptop on it’s own. Also, when it comes to thin, Razer still have Alienware well beaten in this category, with the Razer Blade sporting a 17.9mm thickness compared to the Alienware’s 13 26.3mm (31% thicker). Alienware latest portfolio of laptops offer gamers the choice between mobility and the true gaming powerhouse. In a nutshell, performance specifications have been upgraded with the latest Intel Haswell Processors and Nvidia GeForce 900 Series. Also there are display options available, notably matte options and FHD, QHD, 4K on selected models. Lastly, all are now compatible with the Alienware Graphics Amplifier. 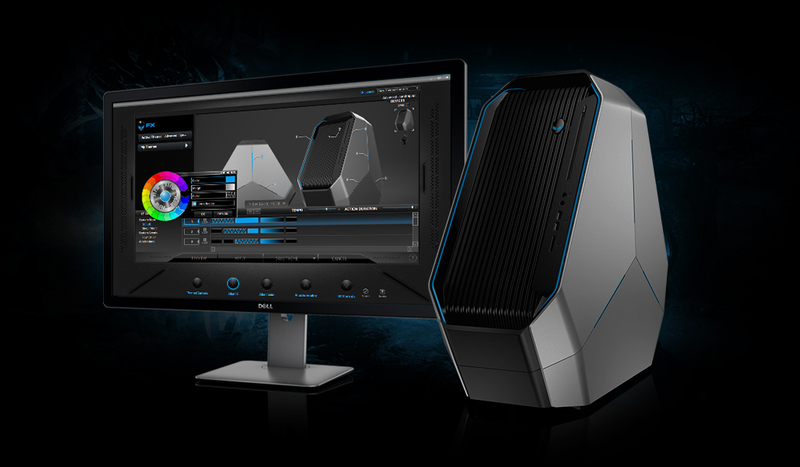 Alienware pushes the boundaries of bringing gamers the best visuals of the future. Packed with the latest gaming technologies, gamers are now able to enjoy even the smallest of details and appreciate the most graphically stunning games. Despite its small frame, the Alienware 13 does not compromise on visual clarity, offering an optional display powering a 2,560×1,440 QHD resolution. This 13 inch QHD (2560 x 1440) IPS-Panel TrueLife 400-nits Display with Touch Technology would cost you an additional $362.73. The new Alienware 15 and 17 are also packed with Intel Core i7 quad-core processors and NVIDIA GTX 980m graphics to deliver maximum graphics performance for even the most intensive games. The Alienware 17 offers a higher base graphics option and higher maximum CPU option than any other Alienware notebooks, promising supreme speed and performance as gamers immerse themselves in the action. Alienware laptops bring to mind cool, sharp looks. All three laptops offer AlienFX Lighting Zones, which offers unique programmable zones with up to 20 distinct colors providing over 25.6 billion lighting combinations. There’s also a multi-color RGB keyboard with a fully lighted touchpad. Gaming laptops need to offer good sound quality. Wasn’t able to test out the speakers at Altimate club-like venue but specs-wise, it does have some impressive internals. The Alienware 13, 15 and 17 are powered by Klipsch and Creative Soundblaster X-FI technologies, users will enjoy the best sound quality they need when playing their favourite videogames. The Alienware 15 is available now starting at SGD$2,499. The Alienware 17 is available now starting at SGD$2,699. The Alienware 13 is available now starting at SGD$1,999. When paired with the optional Alienware Graphics Amplifier featuring a desktop GPU of your choice, gamers now have the perfect solution for the full rush of ultimate gaming. The Alienware Graphics Amplifier boosts the already potent gaming performance of laptops, providing desktop graphics quality gaming at home. By simply rebooting, users can get lost in the vivid display and massive performance boost of desktop-class graphics. It also features four powered USB 3.0 ports, so gamers can have instant access to their favorite peripherals and output directly to their gaming displays. The latest Alienware 15 and 17 laptops includes an Intel Core i7 processor configuration that is automatically overclocked when paired with the Graphics Amplifier for a more complete system performance. As impressive as the whole concept is, the cost of the graphics amplifier and the desktop GPUs might set you back as much as a gaming desktop already. So other than having all your system settings and games consistent in your laptop to desktop transition, I don’t really see much advantages in such a setup. The Alienware Graphics Amplifier is available now starting at SGD 418.99. The Area-51 sports a newly redesigned Triad chassis; which is HUGE. This gaming behemoth measures in at Height: 22.4″ (569.25mm) x Depth: 25.156″ – (638.96mm) x Width: 10.736″ – (272.71mm) and weighs 28 kg. It uses the Intel x99 Chipset, support for newest Intel Haswell-E cpu’s (skt LGA 2011-v3); 2133mhZ DDR4 memory; 1.5 kW power supply; support for tri/quad graphics; and liquid cpu cooling. The Alienware Area-51 desktop is available now starting price at SGD3,999. That’s only the basic option though, running a NVIDIA® GeForce® GTX 970 with 4GB GDDR5, and if you were to deck it up with configurations such as Triple NVIDIA® GeForce® GTX 980 graphics with 12GB total GDDR5 (3x 4GB) GDDR5 -NVIDIA SLI® Enabled and 32GB RAM, prices quickly escalate up to the 8K region. 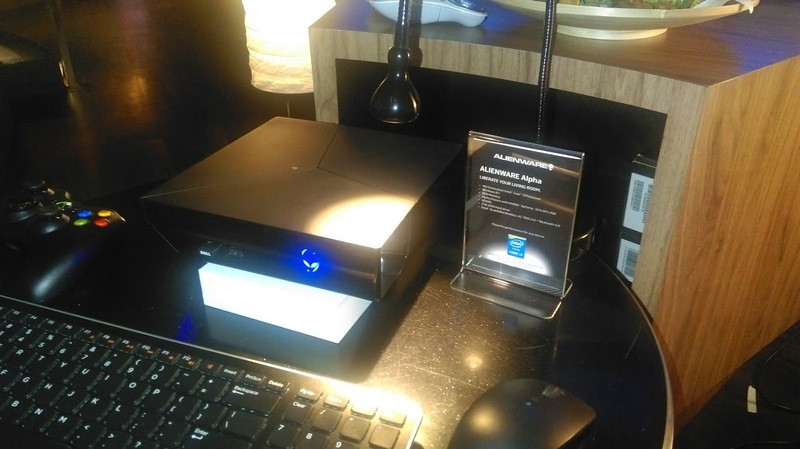 Coming from the Area-51, the Alienware Alpha is one tiny box. The Alienware Alpha brings the best of both worlds together by combining the freedom of PC gaming with the ease of a console. The exclusive Alienware user interface allows gamers to navigate all of Alpha’s core functions with the included Xbox 360 controller. Users can choose to launch Steam Big Picture, adjust core system and AlienFX settings and access their media – without needing a keyboard and mouse. Featuring the 4th Gen Intel Core i7 Processors, graphics powered by a custom-built NVIDIA GeForce GTX GPU 2GB GDDR5, gamers can enjoy gaming on a big screen in 1080p Full HD beauty. It’s unfortunate that the Alienware Alpha would be priced at S$1699. The US equivalent model is available for US849.99, which is more reasonable but I thought they should bring in the lower end i3 version of the Alpha which retails at US$499. That’s a more reasonable console pricing. While there are key advantages of a PC-architecture based system, such as upgradability, graphics performance, cheaper games, but this comes to moot when at the price point, you can pick up two XBOX One / Playstation 4 and still have cash to spare. It would be available from early March 2015.